Our right triceps become very challenged if we can not sufficiently engage our left internal obliques and transverse abdominals during active late left lower extremity ‘push-off’ and concomitant active late right upper extremity ‘push-back’ (shoulder extension). Our bodies lose their ability to become centered over the left when our left abdominals, left hamstrings and right triceps disengage as a functional group. A few weeks ago Sy Abe-Hiraishi, a PRI faculty member, asked me about a non-manual technique called the ‘Supine Weighted Tricep Curl’ and the reasoning behind the two methods of instruction. I absolutely loved the question, the dialogue and the timing, since I will be presenting information on group function afferentation at this year’s Spring Symposium. Please read her summary and the response that is presented from a question that was initially asked by a course attendee that attended one of her courses in Japan. So awesome! This is me, Sy writing this blog post – those of you who do not know me, I am one of the two PRI faculty members that are designated to teach courses in Japan. We hosted our very first Postural Respiration courses in Japan in December, and this interesting question came up from a participant. Today I am hoping to share the question and answer with y’all…(in case you cannot tell, I currently live in Texas). Ron specifically requested that I post this both in Japanese and English, so here it is – hope y’all enjoy! And here’s the longer-version of the answer. Everything we do can be applied into various phases of the gait – so please picture yourself being in the right mid-stance. Your L AIC pushed you over to the right, you are feeling the right heel and the right mid-foot, and you just finished swinging your right arm all the way forward. Now look at Position A – both right shoulder and elbow are flexed – doesn’t it look awfully similar? If you are thinking this position is mimicking the I-just-finished-swinging-my-right-arm-forward phase, you are absolutely right! Now think what needs to happen next. You will need to begin swinging your right arm towards the back as you start to prepare yourself for the push-off phase, and eventually to shift your body weight to the left. The initiation of the right arm swing is essential because, without this, your right arm won’t be pulled all the way back, your right trunk won’t be pulled back, and the right trunk rotation won’t occur. Combined with L AF IR, the back-swing of the right arm is the key for the upper and lower body integration as shown in the picture below. And hence the beauty of this exercise. Triceps curls in this position (Position A) is a great way for us to practice the initiation of the right arm swing. In this position, the triceps are elongated through the combination of shoulder flexion and elbow flexion and can be effectively isolated isolate. However, here’s a pitfall of “Position A.” Because performing triceps curls in this position promotes sagittal movements, some patients just cannot help but extend their back. Those individuals weren’t quite ready to truly isolate the triceps and may need to take a step back – and try the alternate position, Position B. So now look at Position B. You also see the same gait phase in Position B, but the arm is swung to the side (on the transverse plane) instead of up to the front (on the sagittal plane). This arm position promotes the trunk rotation to the left, the better left abdominal engagement and the right scapular stabilization on the thorax, which further secures the right triceps. In this position, the patient will be given the mechanical advantage to remain in the state of exhalation (and thus not to extend the back) while activating the right triceps. Let me summarize it – “When using triceps curls to facilitate the activation of the right triceps, anyone should try Position A first. If the patient extends the back in this position, try the alternate position, Position B for the better abdominal integration.” I hope that this answer helps y’all, PRI families in both Japan and the U.S.! P.S. 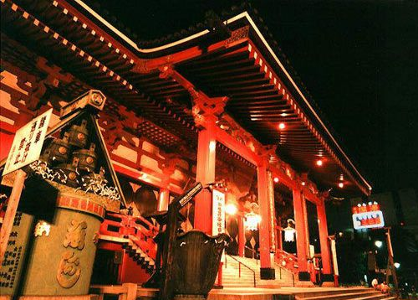 – I showed this (power point slides that we used in Japan) to Ron and he told me I HAVE to post this photo in this blog. I created some visuals and added them to the slide explaining the importance of the right low trap and right triceps…well, I am sure y’all can read the rest ;) We will continue to strive to teach high-quality, full-of-fun PRI courses in Japan! Circle Explanation: That's the cross-sectional view of the R BC-patterned chest....L lungs are more inflated than R, and the sternum tipped to the R. Orange semi-circles in this diagram represent SAs, and the light-blue lines are the lower traps. I use this diagram to explain how "L SA is rounded yet elongated (= challenged)" and "R SA is shortened yet flattened (= also challenged)" - sort of like obturator internus. Also, this diagram may help visualize how low traps are positioned in the transverse plane. For example, R low trap is shortened in the frontal plane (as shown in the image on the left...the back view), yet it is actually elongated in the transverse plane if you are to take a look at the image on the right (light-blue line)...the opposite is true for the L low trap... and therefore, again, both lower traps are challenged in its own way. Happy New Year from Japan! Did you know that New Year's in Japan is much like Thanksgiving in the U.S.? All the family members get together, eat and drink all day...the best time of the year! 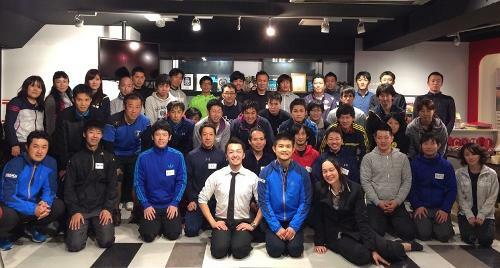 Anyways, I just wanted to share some photos from the two Myokinematic Restoration courses (Dec 19-20 in Tokyo, Dec 26-27 in Osaka) that Kenny and I taught in Japan. We had two super-hard-working groups of clinicians who were willing to take this intense course even during the holiday season (some of you may have heard, but when we open the registration, these courses were filled in a few hours - wow!). They were dedicated learners - highly engaging, thinking critically and asked tons of great questions. We are proud and excited to add 45 (Tokyo, middle pic) and 41 (Osaka, bottom pic) new members to our PRI Family! 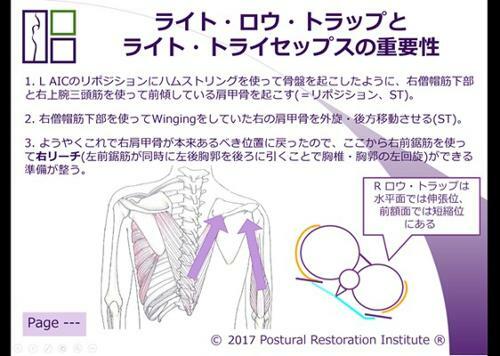 We will continue to offer Myokin courses at various sites in Japan (Nagoya, Tokyo and Fukuoka) this Spring/early Summer, hoping to start offering Postural Respiration courses by the end of this year. If you are fluent in Japanese (because who isn't? ), please check our PRI Japan Facebook page for ongoing communications. PRI continues to grow in Japan in 2016...it'll be a great year! Hi everyone! I just wanted to share a fantastic experience I had earlier this month! I was invited to speak at SPATS (South Padre Athletic Training Seminar) hosted by VATA (Valley Athletic Trainers’ Association) last weekend. Since they gave me a total liberty of picking my own presentation topic, I took full advantage of it and decided to use that opportunity to spread the PRI word. My lecture topic was “Let’s Blow Up a Balloon! Breathing in Orthopedic Rehabilitation.” Since my time was limited, I choose not to go in depth on the polyarticular chains and explain all the PRI terminology (i.e. L AIC, R BC etc). Instead, I focused on the left-and-right difference of the diaphragm, the importance of restoring the ZOA, and learning how to…EXHALE!!!! There were many attendees (mostly ATs, but also some PTs, DCs and MDs) and it was truly fun to watch approximately 300 people blowing up balloons! It was very well-received as many participants came to talk to me afterwards, asking about the PRI concepts and courses. I am glad to say there’s a growing interest in PRI down here in South Texas! CLICK HERE to view my presentation!